In an S-1 filed earlier today, a self-identifying blank check company (or “SPAC”: special purpose acquisition company) from Boston by the name of L&L Acquisition Corp registered its Initial Public Offering with the SEC, to the tune of $50 million. It was, by our reckoning, the seventh IPO by a SPAC this year. Could this on-again, off-again entrepreneurial enterprise be on again? 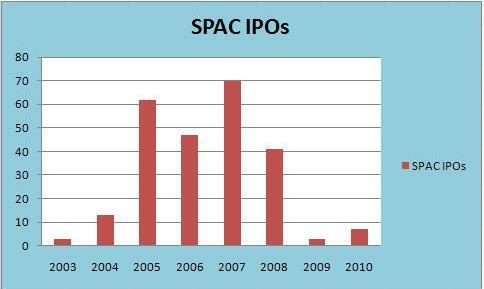 The chart below shows the rise and fall of SPAC IPOs since 2003. They peaked in 2007, with 70 such offerings, and stayed strong in 2008 before falling off the cliff last year, when only 3 were filed. With the number having now more than doubled from last year, one might be forgiven for speculating that the SPAC IPOs pendulum is beginning to swing back the other direction.